IMAGE ABOVE: Hope Stone Dance Company in Jane Weiner’s i scream. Photo by Simon Gentry. Sustainability is a hot topic among dance professionals at arts conferences, seminars, workshops, and roundtables in Texas and beyond. Identical terminology aside, this particular conversation is not about reducing human impact on the environment but on the capacity of dance organizations and the art of dance to endure. Though a blueprint or formula for sustainability would be a relief, the diversity of missions among the contemporary dance artists and companies of Texas requires very individual problem solving. Responsible for the creation of new work, a director wears multiple hats, but the role of choreographer is often the most easily taken for granted. As a result, it is often the most undernourished of the director’s responsibilities—ultimately leading to fatigue of the artist and degradation of the work. “My dad told me to take one day a week and do nothing related to dance,” says Karen Stokes, who spearheads Houston’s Karen Stokes Dance. She tries to follow the advice, explaining that without the time and space completely away from dance, her productivity and creativity become muddled, bogged down, and boring. Entire organizations, not just the work, can suffer when their directors run the vehicle for too long without refueling their own bodies, minds, and souls. Burnout is what Andy Noble, of NobleMotion Dance, says is the number one threat to sustaining his still young company, whose directorship is shared by wife, Dionne Noble. “We’ve worked tirelessly on NobleMotion for four years for very little income. We also teach at Sam Houston State University and are raising two kids. We love what we do so much—but we are reaching the point where we cannot put much more onto our plate without letting our art, much less our sanity, suffer.” For NobleMotion, part of the solution has been finding ways to hire staff to offload some of the duties of its directors. 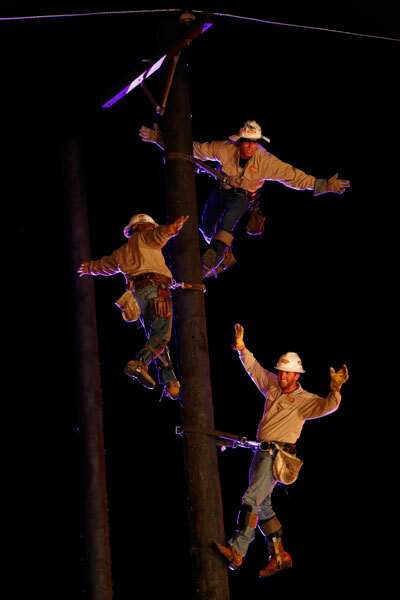 Harold Reyes, Eric Brown, Ryan Moore in Allison Orr’s Power Up, a production of Forklift Dance. Photo by Amitava Sarkar. Most contemporary dance companies are also opting for the “less is more” approach to dance-making, spacing projects further apart. This means presenting only one new work per year—sometimes less frequently— and being willing to, as Weiner puts it, “borrow from oneself” more often to ensure that works have the time to nestle into completion or have the space to evolve, and the chance to be seen and appreciated by different audiences. “No one needs to go to another bad art show,” reminds Allison Orr, director of Austin’s Forklift Danceworks. She urges dance companies to “slow the wheels” and avoid churning out work at an unsupportable rate in order to adhere to a traditional dance season calendar. That dance is not a high-paying career will not come as a shock to most. However, audiences may be surprised to know that contemporary dancers throughout the U.S. often work and perform without contracts, and that few earn an hourly wage for rehearsals and performance. Many agree to a stipend that can easily amount to under $2 per hour. Many more will work for free because it builds their résumé, because the project or choreographer is of particular interest, because performing may connect them to more opportunities, or simply because dancers just want to dance. This isn’t just good for the dancers; it’s good for the dance. Stokes says she is constantly re-envisioning her work to meet the demands and skills of a different group of dancers, a process that takes time and energy away from new work. It’s not that Stokes hasn’t been able to build loyalty among her performers, but like any pick-up or project-based company, the turnover rate is high. The ability to take better care of their performing artists is frequently cited by company leaders as instrumental to growth and sustainability of a dance company. After considering the amount of money spent to perform in larger Houston venues (equivalent to the cost of a brand new vehicle), Weiner decided to stop doing it. “I’d rather pay the dancers,” she asserts. The Bruce Wood Dance Project in edge of my life so far. Weiner is creating jobs for her dancers too. Considering them family, she keeps them closer to the nest by having them teach Hope Stone kids, teen, or adult classes, ensuring that they receive regular company classes, and giving them instrumental roles in program expansions like the second-string company of young artists, Hope Stone Dance II, which will headline a production in May of 2014. The motto for Dallas choreographer Bruce Wood and Bruce Wood Dance Project (BWDP) is, “It’s about the work.” Everything else, including Wood himself, is secondary. 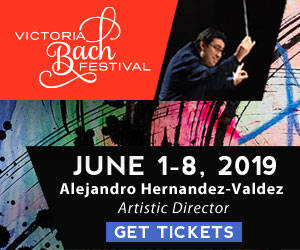 Since its establishment in 2010, board members and supporters are committed to meeting all artistic expenses while keeping overhead and infrastructure at a grassroots level. “We are all investors in the project and each of us volunteers our expertise to make it be the best. It’s more a calling and a cause,” explains Gayle Halperin, who serves as BWDP’s board president and executive director. Last summer The Dallas Morning News reported that BWDP “backers expressed ambitions to make the ‘project’ more permanent by raising enough money to put the dancers on contract and tour.” Payroll priority goes to the choreographers and dancers, but beyond this, Halperin compares the structure of BWDP to an indie film company where talented artists, who feel strongly about its impact, have come together to champion Wood’s work. “These professionals volunteer their artistry to be part of the project,” she says. “Even if your work has had some success, the fundraising doesn’t get easier,” says Stokes. Her point is most keenly illustrated by the rise and fall of Bruce Wood Dance Company (not to be mistaken for the more nimble Bruce Wood Dance Project, mentioned earlier). “Ironic, isn’t it? Fundraising takes funds,” Stokes quips. Indeed, in addition to financial resources, it takes time and energy. Wiener recognizes that fundraising is not where she wants to spend either of the latter. Coming to terms with the fact that it takes money to make money, she hired a part-time grant writer who not only researches and applies for funds but follows up on the rejections, too. Forklift Danceworks is an intentionally-lean, project-based organization. Orr has framed her art around the expertise and virtuosity within the everyday work life of non-dancing community members. Orr makes sure donors who give up front know what their money is meant to support, and she doesn’t forget to say thank you. She is doing something fundamentally different from that of her peers, but it’s less about the medium of her art and more about the relationship she’s built with her audience. Many companies rely on ticket sales and individual donation to fund performances even though these make up only a small percentage of the overall budget. Orr’s often large-scale events, on the other hand, are free. “We always take donations,” she explains. And, she gets them—her shows are always “sold out” to patrons already excited about the work. It might seem like an easy feat, given the inherent role of community members from all walks of life in her work, but it’s more likely that Orr just makes it look easy. She’s an astute listener and authentically curious about ordinary people and ordinary things. Orr goes out of her way to address what matters to her audiences, to learn and seek support from social services and institutions outside the dance field, and to plan and fund projects far in advance, strategies that often set her apart from peers. Like a lot of artists, Orr funds the work but sustains herself in other ways. Rather than financing a building or a school, two things she adamantly does not want to do, she’s seeking ways to increase earned income. She already works with businesses and corporations as a consultant on team- and relationship-building, and she plans to build and grow further in this direction. 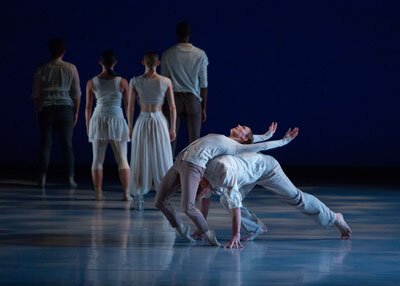 The Houston Met Dance Company in Laura Edson’s After The Rain. Photo by Ben Doyle, Runaway Productions. Buildings and schools are a traditional, if not natural, undertaking for a group organized around dance. Dance companies need space and they need dancers, and they need audiences with enough dance experience to better appreciate it. All of these things a studio can provide, though generally the results accumulate in ripple fashion over long periods. Studio classes and educational programming in general seems to have more immediate impact in terms of marketing, which is interesting since educational outreach is often seen as the wooden leg most dance organizations are made to stand upon when it comes to funding. In general, the Texas dance companies interviewed reported very little income from educational outreach or studio classes. Lauren Peterson is the managing director of Blue Lapis Light, an Austin-based, site-specific, aerial dance company, which can be added to the list of those with community programming, studio classes, and a new building campaign. She confirms, “A small percentage of income from our studio has funded performances in the past, but usually not more than 10%. Our Youth Taking Flight program, which lets Austin’s challenged youth experience the thrill of aerial dance, does not fund any other aspects of the company—only portions of salaries and teacher fees associated with that program.” For the past seven years, Blue Lapis Light has occupied a “deeply discounted space” used for their teaching, rehearsals, and office space. “After searching for over a year for places to rent with our specific height and structural needs, it became apparent that purchasing land and building our own space would be a lot more economical in the end,” says Peterson. 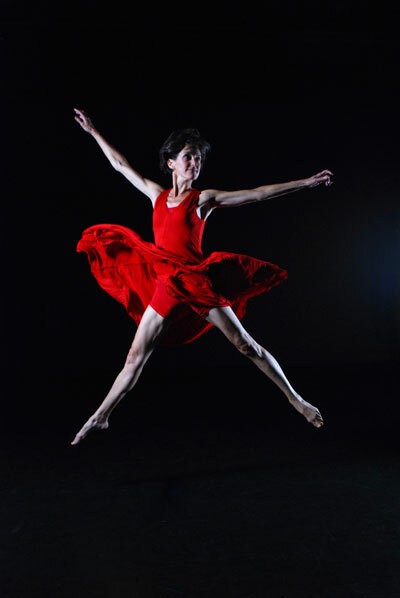 Houston’s Metropolitan Dance Company has also shifted to new spaces. “It was not a matter of wanting to, but a necessity,” says Smith. The company and studios now occupy a space in Houston’s Midtown with four studios, which are occupied primarily by the company and school but also available for rent. Meanwhile, Bruce Wood Dance Project, NobleMotion Dance, and Karen Stokes Dance Group rehearse within the educational institutions with which they are respectively associated. NobleMotion and Stokes, as recipients of the Houston Arts Alliance’s Incubator grant program, have been provided with office space, which Noble describes as “timely” in the growth of the company. Curiously, if sustainability is about not spending more resources than you can cultivate, solutions become a balancing act and not a movement toward growth. Merely sustaining isn’t really enough. Artists want to thrive—not merely survive or maintain. Karen Stokes observes that artists seek and perhaps long for balance, or at least equanimity, but that’s not necessarily where art lives. The art of dance requires counterbalance to keep dance-making and its makers on the edge without falling off.